Pediped footwear is no stranger to my blog. I love their shoes and their commitment to help others. Pediped footwear has now launched a program known as Pediped Rewards with "Purchases with Purpose" Fundraising sale. This program has been created to benefit the pediped foundation. The sale will run through February 5 with select styles available on Pediped.com marked down as much as 50%. Half of the sales from the selected styles will be donated to the pediped foundation to help children in need. Level 1 (spend $100 or more) - At Level 1, customers will receive a $5 credit to use on a future order and they will continue to receive a $5 credit for each additional $100 spent. Level 2 (spend $150 or more) - At level 2, customers will receive free shipping on any order of $30 or more for the remainder of 2012. Level 3 (spend $200 or more) - At level 3, customers will receive free return shipping for the remainder of 2012. Level 4 (spend $250 or more) - At level 4, customers will have through December 31, 2013 to use all of the rewards they have earned. "We are committed to giving back to the community and to our customers,” said Angela Edgeworth, President of pediped® footwear. “The ‘Purchases with Purpose’ fundraiser is the perfect time for shoppers to receive pediped® Rewards and make a difference in the life of a child at the same time. Our new pediped® Rewards program allows us to thank our customers for their loyalty with some great shopping incentives including credits and free shipping." Since the company’s inception in 2005, pediped® has been committed to bettering the lives of children and has donated nearly $1,500,000 in monetary and product donations to children's charities. Heat oven to 350°F. In large bowl, combine sugars, yogurt, egg whites, oil, milk, and vanilla; mix well. In medium bowl, combine flour, baking soda, cinnamon, and salt; mix well. Add to yogurt mixture; mix well. Stir in oats and fruit. Spread dough onto bottom of ungreased 13x9-inch baking pan. Bake 28 to 32 minutes or until light golden brown. Cool completely on wire rack. Cut into bars. Store tightly covered. The new normal is another one because it almost seems odd to have a new normal after all what was the old normal After al while does the new normal become the normal and the old become the past? Preheat the oven to 300°. Butter a 9-inch square baking dish. In a medium saucepan, bring 3 cups milk to a simmer. Add the rice and sugar and stir until the sugar is dissolved. Spread the mixture in the prepared dish, cover loosely with foil and bake for 30 minutes. Stir and continue baking until the rice is tender, about 30 minutes more. Remove from the oven and stir in the remaining 1 cup milk and the currants; let cool. Divide the pudding among 6 whiskey glasses and top with Irish cream. Serve with the cookies. Combine mustard and mayonnaise in a small bowl. Spread 3/4 teaspoon mustard mixture over each of 4 bread slices; layer each slice with 1 1/2 ounces ham and 1/4 cup cheese. Sprinkle evenly with pepper. Spread 3/4 teaspoon mayonnaise mixture over each remaining bread slice; place, mustard side down, on top of sandwiches. Combine egg substitute and fat-free milk in a shallow dish. Dip both sides of each sandwich into the egg mixture. Heat a large nonstick griddle or skillet over medium heat. Coat pan with cooking spray. Add sandwiches to pan; cook 3 minutes on each side or until lightly browned and cheese melts. Cut four 20-in. x 3-in. strips of heavy-duty foil; crisscross so they resemble spokes of a wheel. Place strips on the bottom and up the sides of a 3-qt. slow cooker. Coat strips with cooking spray. In a large bowl, combine the bread crumbs, 1 cup spaghetti sauce, egg, onion, and seasonings. Crumble beef over mixture and mix well. Shape into a loaf; place in the center of the strips. Spoon remaining spaghetti sauce over meat loaf. Cover and cook on low for 3-4 hours or until a meat thermometer reads 160°. Using foil strips as handles, remove meat loaf to a platter. Yield: 8 servings. Cook ground beef and one cup onion in a skillet, stirring until beef crumbles and is no longer pink; drain well. Add salt and pepper. 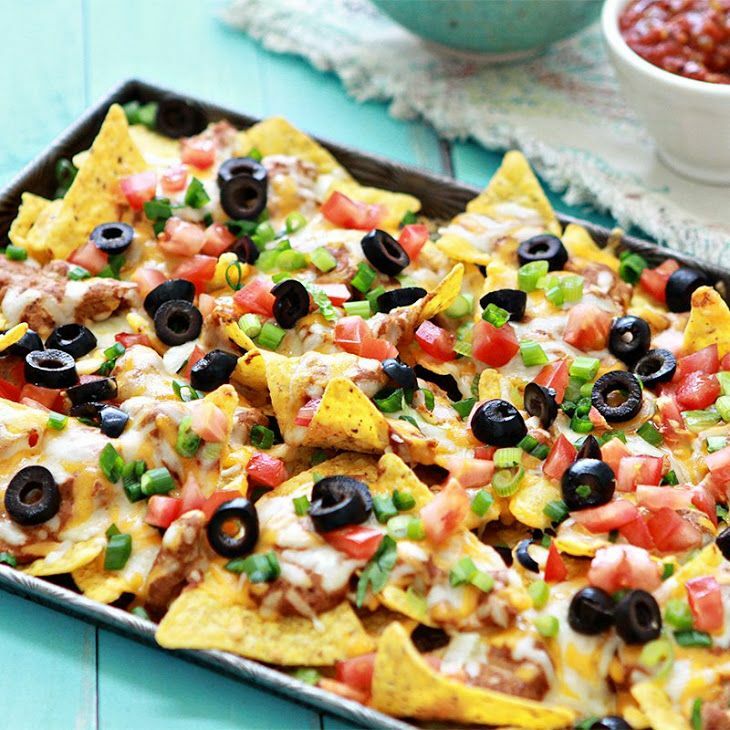 Layer tortilla chips in a lightly greased 13"x9" baking dish; top with beans, beef mixture, green chilies and salsa. Sprinkle with cheeses. Cover and bake at 400 degrees for 8 to 10 minutes or until cheese melts. Top with guacamole, sour cream, olives and green onions. Serve with additional tortilla chips. Cook the rice according to the package directions. Heat te oil in a large skillet over medium heat. Season the chicken with ½ teaspoon each salt and pepper. Cook until golden brown, 3 to 4 minutes per side. Transfer to a plate Add the onion to the skillet and cook, stirring occasionally, until soft, 5 to 6 minutes. Add the tomatoes, olives, and garlic and cook, stirring, for 2 minutes. Return the chicken to the skillet and add the wine. Simmer until the chicken is cooked through and the sauce has slightly thickened, 4 to 6 minutes. Stir in the parsley. Serve with the rice. 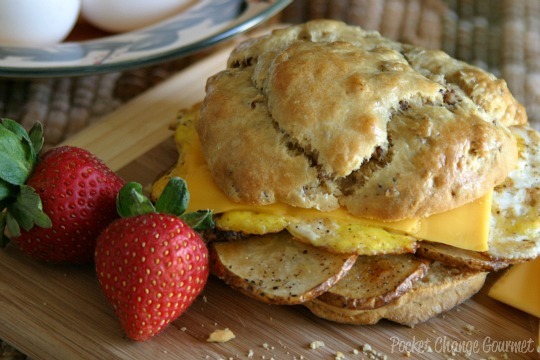 Pocket Change shared a recipe for the ultimate fried egg sandwich and to me it looked delicious I think you should check it out. I wanted to share this recipe because I wanted to share something that happened over 26 years ago when I was dating my hubby. The first food he ever offered me and I picked out was a fried egg sandwich. Now I would love to have a delicious fried egg sandwich but back then I was (1) nervouse to eat in front of my boyfriend and (2) was not sure about an egg sandwich I had never had them before so had no idea if I would like it or not. Now days I have no problem eating with my hubby and fried egg sandwiches are often served up here. This next food shop has a category of its own or should I say I night of its own. Halloween Candy, how many of you snuck a piece or two of what was gathered? hot slice of toast with butter dripping off the edge. As football fans we enjoy a good hotdog when we watch the games. These touchdown dogs are ones that we really love because they pack a punch. Four eggs, one cup of flour (sifted), one cup of sugar (granulated), the juice of half a large lemon, or that of a small one; the grated rind of a lemon. Beat the whites of the eggs until they are stiff and dry, then add the sugar, beating well; then add the well-beaten yolks; then the rind and juice of the lemon; then stir in, very lightly, the sifted flour. Bake in a moderate oven. I just love how the victorian era recipes were simple to the point and the cook knew exactly what it meant. Cook noodles according to package directions, omitting salt and fat; drain. While noodles cook, heat a large nonstick skillet over medium-high heat. Coat pan with cooking spray. Add steak; sauté 5 minutes, browning on all sides. Remove from pan; cover. Melt butter in pan over medium-high heat. Add shallots and mushrooms; sauté 4 minutes. Add garlic; sauté 30 seconds. Stir in soy sauce. Sprinkle flour over mushroom mixture; cook 1 minute, stirring constantly. Gradually add broth, stirring constantly. Add pepper, salt, and thyme sprigs. Bring to a boil; cook 2 minutes or until thickened. Return beef to pan; cook 1 minute or until thoroughly heated. Discard thyme sprigs. Garnish with thyme leaves, if desired. In the 16th century it was to the amusement of many to place live birds in a pie. It is also thought that perhaps the blackbirds have been seen as an allusion to monks during the period of Dissolution of the Monasteries by Henry VIII, with Catherine of Aragon representing the queen, and Anne Boleyn is maid. The rye and the birds, have been seen to represent a tribute sent to Henry VII, and on another level, the term "pocketful of rye" may in fact refer to an older term of measurement. The number 24 has been tied to the Reformation and the printing of the English Bible with 24 letters. From a folklorish tradition, the blackbird taking the maid's nose has been seen as a demon stealing her soul. No corroborative evidence has been found to support these theories and given that the earliest version has only one verse and mentions "naughty boys" and not blackbirds, they can only be applicable if it is assumed that more recently printed versions accurately preserve an older tradition. COOK and stir chicken and cumin in nonstick skillet sprayed with cooking spray on medium heat 2 min. Add peppers; cook 2 min., stirring occasionally. Stir in salsa; cook 2 min. Add Neufchatel; cook 2 min. or until melted. Stir in beans and tomatoes. SPOON 1/3 of chicken mixture into 8-inch square baking dish; cover with 1 tortilla and half each of the remaining chicken mixture and shredded cheese. Top with remaining tortilla and chicken mixture; cover. Oh those delicious Krispy Kreme doughnuts is one of my pick up on the go breakfast. If I have time to pop in the microwave for 10 seconds and heat up even better. Now Krispy Kreme doughnuts have shared a delicious new flavor of doughnuts for all the chocolate lovers everywhere. Krispy Kreme chocolute doughnuts are now here. With a dark chocolate kreme filling the same delicious glazed chocolate cake and a new dark chocolate iced glazzed doughnuts are available at participating Krispy Kreme locations. · For the unabashed chocoholic, The Dark Chocolate Kreme™ Filling doughnut is topped with dark chocolate icing and a milk chocolate drizzle and filled with a smooth dark chocolate Kreme™ filling. · For the occasional chocolate craving, The Glazed Chocolate Cake is a chocolate old-fashioned cake doughnut covered in Krispy Kreme’s Original Glaze. · And for the true chocolate lover, the New Dark Chocolate Iced Glazedtops Krispy Kreme’s Original Glazed® doughnut off with a ring of rich dark chocolate icing. Krispy Kreme offers doughnuts, coffee, mocha, cappuccinos and lattes to name a few of their delicious products. Now you can take your doughnut devotion on the road with you when you travel by being able to locate the nearest Krispy Kreme by downloading their free hotlight app (www.KrispyKreme.com/HotLightApp) You can also check out Krispy Kreme on their website also find them on Facebook,foursquare and Twitter, and KrispyKremeDoughnuts on YouTube. Store cooled leftovers in an airtight container and freeze for up to one month. In a large Dutch oven, heat the olive oil over medium-high heat. Set aside 2 tablespoons chopped bell pepper and add the remaining bell pepper and the onion to the Dutch oven; cook, stirring, until softened, about 5 minutes. Stir in the tomato paste and chili powder. Add the turkey, season with salt and cook, breaking it up and stirring to combine, 3 to 4 minutes. Pour in the crushed tomatoes and beer, bring to a boil, then lower the heat and simmer, stirring occasionally, for 10 minutes. Add the kidney beans and cook until heated through, about 5 minutes more. Season with salt and pepper. Serve in bowls, topped with the reserved bell pepper. Butter a 13 x 9 x 2-inch baking pan. FOR THE CAKE: In a small bowl, combine the yeast, 1 tablespoon of the sugar, and the warm water and set aside in a warm place for 15 minutes, or until bubbles appear. In another bowl combine the remaining scant 1/2 cup sugar, and the salt, and butter. Pour the milk into a saucepan, add the vanilla bean and bring to a boil. Remove from the heat, scrape out the seeds, discard the vanilla bean, and stir the milk into the butter mixture. Let the mixture stand until it is lukewarm. Stir in the yeast mixture and lemon zest. Add the eggs, one at a time, beating well after each addition. Fold in the flour, a little at a time. Beat the dough for 5 minutes, or until smooth. Spread the dough into the prepared pan. Cover loosely with a tea towel and set aside in a warm place for 30-45 minutes to allow the mixture to rise, almost doubling in size. FOR THE TOPPING: Cream the butter, sugar, and brown sugar until light and fluffy. Stir in the almonds, walnuts, cinnamon, and vanilla. Drop teaspoonfuls of the topping onto the dough. Bake the cake for 35 minutes, or until the top is golden and a skewer inserted in the middle comes out clean. Allow the cake to cool completely in the pan. 14 oz. cooked black beans. Sauté in the olive oil the chopped onion. Add garlic, black pepper, dash cayenne, carrot, the chopped tomato, and cook for 3 minutes. Add and mix well the rice, add the water, reduce the heat to low, cover and cook for 15-20 minutes or until rice is tender and the liquid absorbed. Remove from heat and fluff with a fork. Meanwhile, put the black beans in another saucepan with a little water and cook over a low heat, stirring from time to time, until heated through. Once the rice is cooked, add the drained black beans. To prepare crust, roll dough into a 14-inch circle; fit into a 9-inch deepdish pie plate coated with cookig spray. Fold edges under; flute. Place pie plate in refrigerator until ready to use. To prepare the filling, heat a large nonstrick skillet coated with cookig spray over medium heat. Add sliced apple, 1/4 cup granulated sugar, and 1/2 teaspoon cinnamon; cook 10 minutes or until the apple is tender, sitrring mixture occasionally. Spoon the apple mixture into prepared crust. In a large saucepan, combine the chicken, halved onion, garlic, bay leaf and enough water to cover. Bring to a boil, then lower the heat and simmer gently until the chicken is cooked through, 15 to 20 minutes. While the chicken is cooking, in a soup pot or Dutch oven, heat the EVOO, 2 turns of the pan, over medium heat. Add the chopped onion, carrots and celery; add the sugar and season with salt and pepper. Cover the pot and cook until the vegetables are softened, about 8 minutes. Add the chicken broth and 2 cups water to the pot and bring to a boil. Shred the poached chicken into pieces and add to the soup. Stir in the egg noodles and cook until al dente, about 5 minutes. Turn off the heat and stir in the scallions, parsley, dill and lemon peel. Season with salt and pepper.